THE CHUAS OF SHAH DAULAH AT GUJRAT, PAKISTAN: Evidence, Historical Background and Development, with Bibliography 1839-2009. Evidence on micro cephalic children (chuas) at the shrine, and how some of them developed a capacity for independent living. The article gives documentary evidence through 170 years on the so-called 'Chuas', 'rat-children' or 'mice' at the shrine of Shah Daulah, Gujrat city, Punjab, Pakistan. A religious and charitable activity for children with microcephaly and mental disabilities in South Asia was later misinterpreted with allegations of 'cranial deformation'. The abuse story was examined and rebutted by British, Indian and Pakistani investigators, district officers, physicians and anthropologists. The natural occurrence of microcephaly, and innocent local customs of manipulating infants' heads for beauty, gave sufficient explanation. However, some exploitation of people with microcephaly did happen and the government took control of the shrine in 1969. 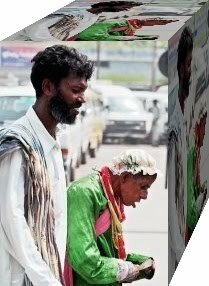 Begging continues within the religious tradition of the itinerant 'faqir', and some microcephalic adults earn their living independently in this role. The 'deformation myth' continues to be a dramatic focus for journalists. The holy man's names may appear as: Shahdaula, Shawdowla, Shah Daula, Daula Shah, Daulah, Daulat, Dawlah, Dawlat, Dhola, Dola, Dowla, Dula, etc. (He was often referred to as the 'Saint', or as a 'Pir'. In this paper, the term 'holy man' will be used. The city of Gujrat, in Pakistan's Punjab Province, is sometimes confused with the Indian state of Gujarat. The name of the province could be transliterated 'Punjab' or `Panjab'. 'Microcephaly' is a feature that may be associated with various medical conditions. It usually indicates a size of human head that is visibly small for the age of the person concerned, and does not seem an appropriate size for that person's body. People with this feature do not actually look like rats or other creatures, but something in the alignment of forehead and eyes probably suggests this demeaning name. Such a name then reinforces their reduction to 'animal status', with loss of human dignity, respect and rights. Other indexable terms: child abuse, anthropology, medicine, psychiatry, religious practice, theories of evolution, waqf, auqaf, social welfare, kidnapping, children's rights, exploitation, Islam, mental retardation, intellectual impairment, disability, independent living, cranial deformation, rat children, skull, brain, head, shape, cosmetic, female infertility, imperial history, Pakistan, India, Punjab, Panjab, Gujrat, shrine. Children and adults having microcephaly, which caused them to be called 'rats' or 'mice', lived at Shah Daulah's shrine in the city of Gujrat, Punjab, for two hundred or more years with little attention paid to them. In 2009, only one or two chuas can still be found there. Microcephalic children are no longer received from their families. Versions of their story have now become an 'internet myth', sustained by intrusive and exaggerated journalism, often evoking rage among distant campaigners against child abuse. Documentary evidence on the chuas, accumulating through 170 years, is shown here to provide a more serious basis for understanding. The questions have all been asked decades ago. Why was the shrine associated with chuas? Why were so many people with microcephaly found in Gujrat? Were they brought there from elsewhere? Did their condition arise naturally through genetic variation, or through the holy man's curse? Were their heads subjected to deliberate deformation? How did they get along in this rural location? Was there any merit in employing chuas to earn their own living by itinerant begging? The written responses of health officials, district officers, religious authorities and anthropologists suggest how 'eye-witness' accounts have confused quite different customs. Interesting conclusions can be drawn about the shrine and the chuas. Shah Daulah was born in the second half of the 16th century (Christian calendar), and he lived for some time at Sialkot. Then he settled at Gujrat, and is credited with various buildings, charitable work, teaching and counseling. Shah Daulah is said to have cared for wild creatures. One report had him placing "helmets, or head coverings ... on his favorite animals". Sometimes women seeking a cure for infertility would come to Gujrat, hoping that the holy man would pray for them. After such prayers, some of these women were believed to produce chuas. In one version of the legend, the first child born after the holy man's prayer was a chua. Later, more chuas were conceived, because other women saw one of the chuhas who was already there. Another version held that Shah Daulah's prayers led to the first child being a chua, and by custom these were left at the shrine after they were weaned. Otherwise, people wanting a child would promise an offering, or dedicate the first-born to the shrine. If they failed to keep their promise, either the first-born would somehow be transformed at birth into a chua, or later children would all be chuas, until the parents paid. In a third version, all the first-born were chuas. They became mentally disabled, and found their own way to the shrine, if their parents failed to present them. Flora Annie Steel, following Punjabi women's oral lore, wrote a further version in a tale of 'Shah Sujah's Mouse', who is obviously based on Shah Daulah's chuas. Her story has the chua out on a begging tour by him. Other accounts showed the chuas accompanied by a fakir or a showman or some other kind of manager. Steel recorded the view that the babies that were dedicated to the shrine were normal, but that they were then secretly exchanged "through agents all over India ... for that percentage of microcephalous infants which Nature makes". Many of the legends seem hard to believe now. They were hard to believe in 1896, when Mohamed Latif of Jallandhar looked at them. What was the sense in asking the holy man for a child, only to receive a feeble-minded chua? It was not the blessing people hoped for. Shahamat Ali, Persian Secretary with the mission of Colonel Claude Martin Wade to Peshawar, reported chuas at Gujrat between 26 and 29 January 1839: "Here is the tomb of Dowla Shah, a saint who is highly respected in the Panjab. It is superstitiously visited by barren women, who, if they afterwards bear children, bring their first-born to the shrine of the saint, who are called chuhas. I saw some of them thus presented..." The custom seems to have already become well established in 1839, so chuas were probably there much earlier. Their mental or physical condition was not recorded until later. From the mid-19th century, European doctors and ethnographers began to look more closely at the chuas of Shah Daulah. The earliest published study is that of 1866 by Johnston, the Civil-Assistant Surgeon at Ludhiana. Visiting the shrine in 1866 he found nine chuas there, between three and forty years old. Johnston liked inventing medical jargon. He called their head shapes "trigonocephalous" or "triconocephaloid", and discussed how abnormalities of cranial development may occur. He did also mention "mechanical agency" that might be used in the head constriction, yet he knew two Hindus who "exhibit a development quite analogous to the Shawdowla chua, and whose crania have never been tampered with in any way". General Alexander Cunningham visited the shrine in 1879 and found 14 chuas there. An unknown number were reported to be out on begging tours with fakirs. W.O. Fanshawe reported that one or two more chuas were presented to the shrine each year. In the decade from 1857 to 1866, 14 boys and 3 girls were added. Harry Rivett-Carnac reported “a legend that the heads of children were sometimes purposely deformed in this manner", to give the distinctive chua appearance, "being restricted in infancy by a clay covering". Johnston had mentioned deformation, but Rivett-Carnac was perhaps the first to give 'deliberate deformation' as part of the chua legend. Yet he could offer no confirmation of it. In 1884, Superintendent Gray of the Lahore Lunatic Asylum noted that "attention has lately been directed to [the chuas] by the Government with the view of collecting information regarding this class of idiots". Gray and his successor William Center gave some details of microcephalic patients known to them, but Gray remarked of one that he found "no evidence to prove that her head has been forcibly moulded or compressed - a practice which some suppose is resorted to in the case of all 'Shah Doula's mice'." Center had three people with microcephaly under his care at the Lahore asylum. In his view they were "exactly similar to those seen in the idiot asylums in Europe". Mahomed Latif also studied the subject carefully in 1896 and also discounted supernatural or artificial theories of microcephaly. The chuas were "merely extraordinary creatures", born in the course of nature. While these 19th century scientific observers were raising doubts about 'artificial deformation' as a cause, other people were picking up and extending the idea. The gadget which they imagined being used to clamp or cramp the infant heads now grew from being simply a 'clay cap' to being an 'iron vessel'. Yet other observers by then had heard of a different regional practice. Mothers often attached a clay bowl to their babies' heads to shape the broad, open forehead that was considered beautiful. A similar custom was recorded in the Punjab in 1929, with the clay cup being "bound tightly to the head and not removed for three or four years". Such reports were still available in the 1990s. Three stories now existed that would cause confusion: 1. the holy man putting helmets on the heads of his animals for decoration. 2. Mothers innocently putting clay caps on their babies' heads to make them beautiful. 3. evil men putting metal clamps on babies' heads, to mutilate and produce a freakish appearance that could be exploited by a showman. There was some interaction between these ideas. Fears were expressed that innocent head-shaping might damage the brain. Haji Kalandar Khan found that women in Dera Ismail Khan made their infants beautiful by letting their heads lie in a small hollowed-out pit. They would not use hand pressure, which "weakens the intellectual faculties". The chuas were studied in more detail by Captain Ewens, Superintendent of the Punjab Lunatic Asylum at Lahore, along with Colonel Browne, Officiating Inspector-General of Civil Hospitals, Punjab. Visiting the shrine in May 1902, they met twelve chuas. Ewens was very likely the first man having significant experience in the field of mental disabilities, who would observe the chuas at the shrine. He did not view them as freaks or oddities. These were human beings with some personality and with different levels of ability. Ewens did not record their individual names, but his report includes individual observation. He also knew other microcephalic children. One at his own asylum had "considerable power of language". Ewens understood how to encourage diffident and disturbed people to 'open up' and display their ability, and thus to make a more accurate assessment of their language capacity. His carefully formulated views are more positive than anything from earlier observers. The shrine chuas were not a single type of 'speechless idiot'. Most of them had more language potential than was apparent. They could have some self-care skills. They were not liable to "wanton filthiness", "revolting tendencies or appetites" and "destructive and immoral acts". Ewens learnt that the income of the shrine was going down, which could threaten the chuas' future there. He was concerned about the chuas going out begging with their managers, believing there was "little doubt that these men to whom they are entrusted ill-treat and neglect them". In fact, there was a law requiring that mentally retarded people should be taken to an asylum. Ewens heard that the numbers had risen from 43 in 1885 to 100 in 1891. Yet Ewens paid tribute to the care received by the chuas at the shrine itself, asserting that "There is not the same objection to their retention in the shrine itself where, being well known, and its inmates always open to inspection, their condition is comparatively safe." Ewens did not find the shrine activities ideal, but he considered that the chuas would do as well there as they would under his own care, since they would remain in the public eye. This was an unusually cordial, unsolicited compliment from the most experienced British psychiatrist in the Punjab. Ewens also dismissed the idea of artificial cranial deformation, as "utterly without foundation". Children with microcephaly were associated with this shrine probably because Shah Daulah had a known interest in the helpless and needy and a particular fondness for wild creatures. Originally the chuas had not gone out on begging tours, but such a custom had come up later, driven probably by the financial pressure of trying to support their growing numbers while funds were diminishing. Thus it became normal "for them all to be actually leased out on monthly payment". Ewens's positive observations and compliment remained unknown to, or ignored by, most later writers, who tended to go back to Johnston's less skilful report of 1866, and subsequent rumours. The Punjab Gazetteer in 1904 believed that superstitious parents "compressing their heads in infancy between boards and bandages", though it listed neither clay caps nor metal gadgets. The dozen chuas then at the shrine came from Kashmir, Kabul and Multan, up to 350 miles away. The Imperial Gazetteer in 1908 reported the chuas as "human monstrosities". Longworth Dames in 1915 believed that "the shape of the head is the result of pressure, and is caused by the mother". Sir George MacMunn in 1933 considered that the chuas "are kindly treated but are taken about as beggars". Only Lodge Patch in 1928 gave a well-informed account of the Chuas. A story about chuas in Urdu by Manto, possibly in the 1940s, gave a glimpse of the shrine, and a further spin to the legends, confirming that some public knowledge of the shrine was available in regional languages, not only in 'official' English documents. After Partition of the sub-Continent in 1947, the shrine of Shah Daulah, now in Pakistan's Punjab, continued to attract some credulous or critical scrutiny. In 1960, Sharif mentioned the "wilful arrest" of brain development by making children wear "a rigid metallic cap". The Government's Auqaf Department, with responsibility for the administration of religious institutions, found this kind of story gave sufficient grounds for action, whether or not it was officially believed. In 1969, the Auqaf Department "took the shrine into its custody and prohibited this inhuman custom which had been practised for the past 300 years". Yet in 1984 the allegation returned, that "metal caps" were being clamped on infant heads. Zaman Khokhar, in a Gujrat newspaper of 1991, alleged that "At the present time, children are made disabled and are used for begging". Ideas of appropriate 'public responses' to people with significant impairments have varied greatly down the centuries, and between people of different cultures. In many rural areas, people with odd behaviour or weak intellect, talking to themselves while wandering in the fields doing no 'useful' work, have been treated with some tolerance, provided they did not wreck food crops. They were classified as being somehow 'God's people', so they should be given some respect and free food. Or maybe they did something useful by keeping watch on animals in the fields, for very small pay, as documented in many countries. In urban areas, where specialised services began to flourish, the idea was growing that mental illness was not unlike physical illness: both were treatable, and the treatment could restore mental or physical health. So the traditional policy of 'benign neglect' was not enough. Sufferers were being deprived of treatment that could restore them to 'normal life'. The focus should be on capability and preventing or reducing impairment or illness. The benefits of occupational therapy, or of some regular light activities in which people with mental disabilities could participate, had also been recognised and implemented early in 19th century South Asia, in mental health services at Madras. Such interests reflect the view of William Ireland, a British authority on microcephaly, who found it "not enough to know that a human being may grow up with a head no bigger than a garden turnip; the interest consists in knowing what mental power he possesses with his fraction of brain." Yet that focus on practical living abilities was still too advanced for the general public. People with microcephaly were still thought by some scientists to be "a case of atavism, the appearance of a type of brain inherited from some very remote ancestral ape". The later 19th century was a fertile period for semi-scientific skull studies and reports on head-shaping, rather than on the practical and beneficial merits in which Ireland was interested. Among those interested in practical ability were some who wished to engage in care and formal service for people with disabilities, especially mental retardation. That condition has been a recognised 'problem' since Indian antiquity, or perhaps just a feature without very much negative value attached. Formal services for people with mental retardation and their families did not appear in North India before 1918, though it flourished in Madras a century earlier because a few people there found it worthwhile to innovate, and the results justified their optimism. In most of the sub-continent, such care as was offered to mentally retarded people would been from their own immediate family. The local village or small town community might afford some tolerance, a little leeway to cross the boundaries of 'normal behaviour', or the role of the festival 'fool' or buffoon, licensed for one day to play monkey tricks. In terms of more formal resources of some benefit, shrines and holy men were used by ordinary people for counselling and help with problems that were beyond them or were perceived in religious terms. There were a few such specialist shrines, acquiring a reputation through some particular incident or story. Some of these were in the disability or mental health field. The Baba Ziarat at Buner in Swat was famous for the healing of "the crippled, the blind, and the lepers". It was a place of resort for families with mentally retarded members. Nearer Gujrat, the pirs at Chak Chattha in District Gujranwala reportedly still brand the heads of people with mental illnesses, and use other violent treatments, to drive out the 'spirit'. One outcome of the various developments of thought and practice in devising appropriate services is that there continued to be room for the idea of Chuas going around begging within the community, fulfilling a role of 'fakir' or assistant fakir, entitled to beg for food or money as one of 'God's people', while dispensing the 'blessing' of God. Such a role seems to have been acceptable to ordinary people. It accorded with Islamic charitable practice and duty. This may partly explain the paradoxical situation described by Katherine Ewing after the Auqaf department took over administration of Shah Daulah's shrine. Ewing visited the shrine in 1976 and learnt from local faqirs, engaged in itinerant begging, that they "had hired the chuha from the Auqaf Department for an annual fee". Ewing found it hard to understand this "bureaucratization of a practice seemingly antithetical to the goals of the Auqaf Department". However, the Auqaf officials knew very well that to stop the chuas going out begging would make them dependent on the public purse or community chest, or some much more abusive situation. The Auqaf would then have needed to set up of some kind of institution, in which the chuas would have no useful role and would also probably be abused. Even if the chuas' fakir, manager or showman might engage in some unpleasant practices, there were benefits to the chuas in being out and about in the community, having a minor religious role and collecting money by their efforts. It was a kind of 'independent living'. It would hardly look attractive to 21st century western advocates of such policies. Yet witnesses 80 years ago found it quite impressive; and similar independent self-support activities continue to the present day. The notes above on care and services are needed for a balanced view of past activities at Shah Daulah's shrine. 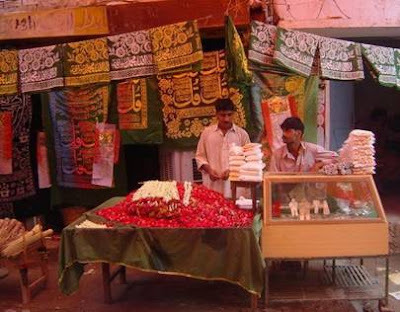 Whatever may be its religious value, the association of this shrine with people having microcephaly now seems anachronistic and abusive to many of Pakistan's mental health and education professionals. Yet the greater part of its work was done in earlier times. Any evaluation must take into account the historical context. Belief in the power of curses to cause disability has weakened since Shah Daulah's time, though it is still widely attributed to rural people. There is also little reason to think the holy man cursed anyone seeking his help. He knew very well the imperfections of humankind. An early legend had Shah Daulah hurrying to plead on behalf of the rough-tongued Gujrat townsmen, when they offended Guru Hargobind as he rode through the city. Exactly when and how the chuas first became associated with the shrine is now impossible to know. The earliest shrine records do not mention chuas. Probably at some time a woman bore a microcephalic baby after visiting the shrine, and returned later to ask what it meant. One such infant, when staying at the shrine and being seen by many pilgrims, would be enough to draw others of similar appearance, reinforcing the legend. The holy man's known interest in animals would support the idea that he some hand in the matter. In fact, the holy man's hand was thought to play a part in shaping the chua's head. Some believed that chuas were born "with a panja marked on the forehead". The 'panja' was a paw, or five-fingered hand. The legend of Shah Daulah putting helmets on the heads of his favourite animals, together with the widespread innocent custom of shaping infant heads with clay caps or cups, could account for rumours of chuas having their heads artificially 'clamped'. The idea of deforming or mutilating children, far beyond any concern to improve their head shape, seems very odd. Yet there is some evidence that such mutilations have occurred in many parts of the world across centuries. Microcephaly as a natural occurrence is certainly found worldwide. In fact, there is no scientific evidence that microcephaly can be produced by deliberate cranial deformation. It is very unlikely that it could actually be done without fatal damage to the growing brain. Did artificial deformation take place at Shah Daulah's shrine? The evidence against this shrine is weak. It is not in some remote place beyond reach of the government's gaze. The shrine is at one edge of a city of some significance. Through much of the 19th century there were official visits, studies and enquiries about the shrine, yet as Lodge Patch remarked, "During the eighty years of British administration not a single charge of such malpraxis has been brought against the priests at the shrine of Shah Daulah..."
No 'metal caps' or 'iron vessels' have been produced as evidence. If such gadgets existed for clamping infant heads, they must have been solid and made for the purpose, in several sizes. Plenty of officials, anthropologists and others would have liked to get an example, and willing to pay a reward to the finder. Thousands of people have visited the shrine annually in a country where very few secrets can remain hidden. The presence of chuas, and their curious appearance, drove many people to try to get to the bottom of the puzzle. If any serious public evidence had been produced for the 'deformation' idea, there would certainly have been an uproar. Yet there is no record of any such evidence or uproar. On the other hand, any glimpse or memory of the apparatus of 'innocent' head-shaping, using clay caps to make infant heads broad and beautiful, would be enough to support rumours of head clamping for exploitation. Could the chuas have been artificially deformed elsewhere, then brought to Gujrat as part of the kidnapping and begging traffic? Again the case is weak for most of the reasons given above, though it cannot be entirely dismissed. Elliott in 1902 wrote that there were strong suspicions, but "the matter has been treated always 'confidentially,' and had better remain so. The papers and files are in the District Office". Yet Elliott admitted that, "a more rational idea" was that such children occurred naturally and were brought to the shrine. By 1915, the clamping theory was losing ground. A local Settlement Officer, noting the allegations, wrote, "I understand that the artificial deformation is doubtful". In 1921 that view was recorded in the District Gazetteer. If the District Office papers actually had any serious evidence, it is hard to see how the balance of official opinion could have swung over to dismissing it. These practical objections then return the focus to the third way in which the presence of chuas at Shah Daulah's shrine may be accounted for. Microcephalic children born in this region as in all other parts of the world, were brought here and were cared for - at least in the earlier period of the shrine. For this, there is reasonable evidence. It is the view of the 'scientific' observers. The modern shrine-keepers give the same explanation. It does not involve any deformation process that would probably be fatal if it were tried. While it is not easy to prove that the chuas were well cared for in the earlier period, it is not an unreasonable guess. Families could hardly have forced shrine-keepers to accept their disabled child, if they were unwilling to care for such children, in Shah Daulah's tradition of care. Thousands of disabled children have been taken to shrines all over Pakistan for prayer and relief, as still continues today. Yet Gujrat seems to have been the only place where families left their child with others as a little community. To take up the care of disabled children handed over by families, at a site regularly in the public eye and very near a Government District Office, was no light task. Presumably the chuas were seen as symbols or tokens of the holy man's supernatural powers, which helped to generate more income for the shrine, and to be part of the 'show'. Yet this gives further reason to think they would have been cared for reasonably well, both by the shrine custodians and the pilgrims. To have shown visibly abused children to the public would have been a very poor advertisement for the shrine and its religious claims. The gathering of microcephalic chuas at the shrine of Shah Daulah was probably begun in a charitable spirit. It weakened over time to become a form of exploitation. Yet by their participation in 'begging tours', some of the older chuas grew up to live semi-independent lives. They generated income by their own efforts, and they were held in some respect and awe by the rural population. Some probably had sufficient understanding of their situation to enter into it with pride. The Auqaf Department of Pakistan was very likely justified to intervene in 1969 on welfare grounds, and as part of the country's modernization of attitudes and services for disabled people. Yet no serious evidence has ever been presented to support charges of cranial deformation. In the context of South Asian living conditions in an earlier era, the shrine of Shah Daulah may have been a pioneer kind of 'caring service' for young people with a significant impairment. For some of them it provided the opportunity to move on to a form of independent living, in which the chuas, as 'God's people', provided a blessing to the rural believers, and those believers provided them with the means of livelihood as a legitimate response to religious duty. This article was originally published on http://www.independentliving.org/miles201005.html where you can also find references for this report. This article does not written by the owner of this blog website and so it does not reflect the ideas/thoughts of the blog owner. This article was originally written by a Non-Muslim Foreigner and there may be few things in contrast with Muslim's Beliefs in this article. The purpose of re-publishing this article here is to just show the research done in this myth subject and to open a discussion about this issue of human rights. Your valuable comments about this topic will be highly appreciated, but be courtesy please, either in the favor of the article or vice versa. one thing more that if first baby is having a normal sized head then they transform it into small head(microcephaly) by fixing the child's head in an iron rim and thus growth stops ..
one question no one has answered in this report, so is it true the if a female can not have a child and they go too the shrine and pray will the female give a birth to a child regardless of the childs condition.. ?????????????? is there any evidence to sport that? i think it is more considerable to believe that an ironic rim is placed on an infants head...and all of them are male that i have personally seen and if the woman is supposed to give away her first child in the service of the shrine the how come there are no female chuas cuz these authorities may be using females for other purposes to earn cash....... it is atleast what i consider. I am not sure if my comment supports the reality. No-one has yet commented that this condition is an autosomal recessive inherited disorder - meaning that a child is afflicted because both parents carry a faulty gene that controls brain/head development. Two faulty genes (one from each parent) are more likely to come together in cultures where cousin marriages in successive generations is prevalent. No-one has yet commented that this condition is very probably an autosomal recessive inherited disorder. In other words it is caused by the passing on to the child, two faulty genes (one from each parent) that control head and brain development. Autosomal recessive inherited conditions are more likely if the parents are cousins in a long succession of cousin marriages.